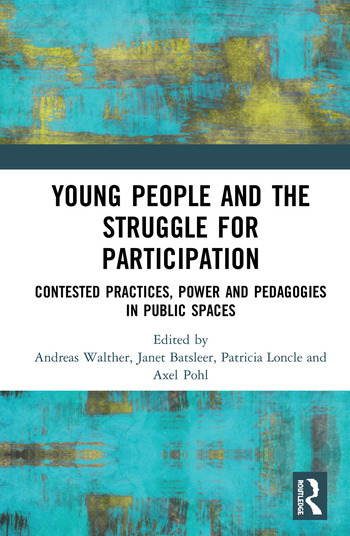 Young People and the Struggle for Participation rethinks dominant concepts and meanings of participation by exploring what young people do in public spaces and what these spaces mean to them, individually and collectively. The book discusses how different spaces and places structure and are in turn structured by young peoples’ activities. Drawing on findings from a comparative study in eight European cities, the book presents insights into different styles of youth participation emerging from formal, non-formal and informal settings. The book provides a comparative analysis on how transnational discourses, national welfare states and local youth policies affect youth participation. It also investigates how it comes about that young people get involved in different forms of participation in the course of their biographies. This book will appeal to academics, researchers and post-graduate students in the fields of youth studies, community studies, sociology of education, political science, social work, psychology and anthropology. 1 Contested practices, power and pedagogies of young people in public spaces: an introduction. Andreas Walther is Professor for Educational Sciences and Director of the Research Centre ‘Education and Coping in the Life Course’ at Goethe University Frankfurt am Main, Germany. Janet Batsleer is Reader in Education and Principal Lecturer in Youth and Community Work at Manchester Metropolitan University, UK. Patricia Loncle is Professor of Sociology at the French High School of Public Health, Rennes, France. Axel Pohl is Senior Researcher at the Institute for Social Work and Social Spaces at the FHS St. Gallen, University of Applied Sciences, Switzerland.